For a series to earn this “honor,” it has to meet these two criteria: the last episode has to have debuted at least a year ago and I have to like the series. A lot. As in re-watching it over and over. Without any more fanfare, please welcome ​Re:ZERO - Starting Life in Another World- to the Caw of Fame! Amazon has some interesting merchandise from this series. Please check it out! It only takes Natsuki a few moments to realize he's been transported into a fantasy world. His initial elation is, let's say, tempered as events unfold... Capture from the Crunchyroll stream. This balance of power is in danger of unraveling because the royal line seems to have abruptly died off or disappeared. There's a scramble among several contenders to ​present their claims to a council of wise men. Above all of these efforts hangs a cloud of uncertainty, because no one knows how the dragon will react to these developments. ​Will it continue to protect the kingdom against the Witch of Envy? Or will it let the kingdom slide into ruin? While humans appear to be the dominant species, we know that there are also elves somewhere because one of the main characters is a half-elf -- just like Satella. Many characters practice magic. Some use their own power ​while others are Spirit Art users, meaning they can draw the power for their magic from the world at large. The main character is a NEET named Subaru Natsuki. He's bright, impulsive, and likes his comfort. When he steps out of a convenience store in modern Japan and finds himself inexplicably in a fantasy world, he immediately deduces what has happened and sets about finding out why he was called to this world. His experience in gaming leads him to believe that he's in this world to fulfill some major quest. In retrospect, seeing his enthusiastic optimism is painful. More on that later. When he arrives in the world, he's armed only with a track suit, tennis shoes, cell phone, and some snacks. 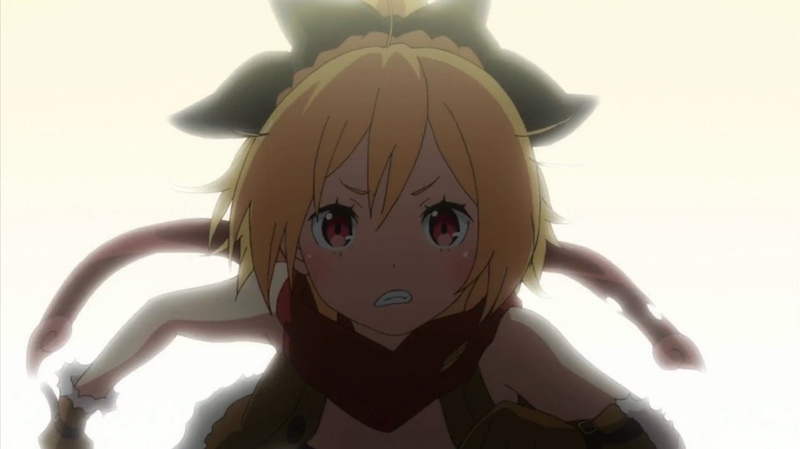 Felt is one of the first characters that Natsuki meets. He didn't know it at the time, but she had just stolen something very important from Emilia, and she was trying to escape. Capture from the Crunchyroll stream. ​One of the first notable characters Natsuki meets is Felt. She's just stolen an important item and is trying to ​escape. She lives in the slums and vows later to Natsuki that she isn't like ​the other slum dwellers. She's destined for something greater. Shortly thereafter, he meets Emilia, who's chasing Felt. That's because Felt had stolen the important item from her. 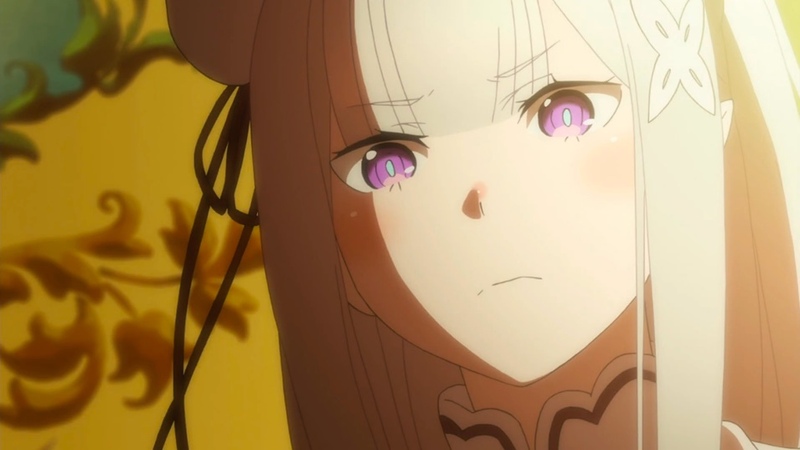 ​Emilia's half-elven. She has silver hair and a hopelessly gentle heart. She's frantic to get back her imperial seal, because it identifies her as one of the candidates for the monarchy. If she can't protect that, well, the council of wise men might just conclude she's not up to the task of ruling. She's a Spirit Arts user, and Pack/Puck, a spirit of increasingly mysterious nature, is her constant companion. At least, he is during daylight. He has to sleep to recharge during the evening. Emilia and Pack/Puck are inseparable. Emilia tries to act tough when the situation requires, but she only barely pulls it off. She's too nice! Capture from the Crunchyroll stream. We learn later that Emilia lives at the estate owned by Roswaal L. Mathers. He's a colorful character -- literally colorful. 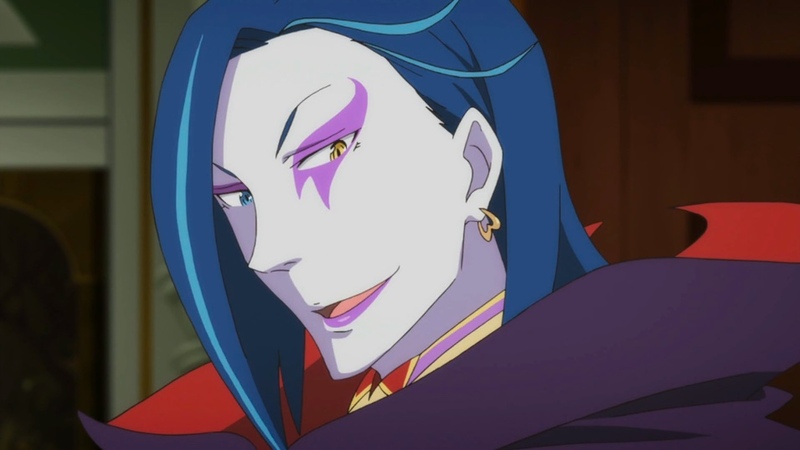 In fact, he has such unexpected facial makeup that Natsuki at first mistakes him for pre-dinner entertainment. ​Did I mention Roswaal has a good sense of humor? ​He is the lord of the surrounding area, and he takes his responsibility to the villagers seriously. He's also completely dedicated to Emilia's efforts to claim the throne. Natsuki's really luck that Roswaal has a great sense of humor. Otherwise, their first meeting might not have been so pleasant. Capture from the Crunchyroll stream. Roswaal employs a number of fascinating characters. Beatrice, for example, is a non-human magical being who protects the estate's magical library. She's sharp-tongued, has no patience of stupidity, and absolutely adores Pack. Despite being a huge estate, Roswaal apparently employs only two others: Ram and Rem, who are twins. Ram's the older sister, and that become important half-way through the first cour. They rely on each other extensively to the point they sometimes speak for the other. Ram's hair is red whereas Rem's is blue. Otherwise, they look similar. 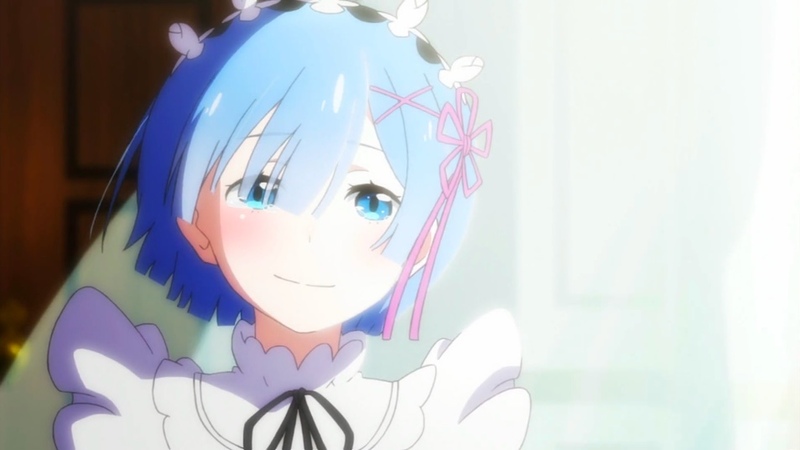 Just so you know: Rem's not only my favorite character of the series. She's in my top 5 favorite anime characters, period. Neither Ram nor Rem thought much of Natsuki when the first met him. Or "second" or "third" met him, for that matter... Capture from the Crunchyroll stream. ​More characters show up and gain importance as the show goes on, but these are enough to explain why I love this show. 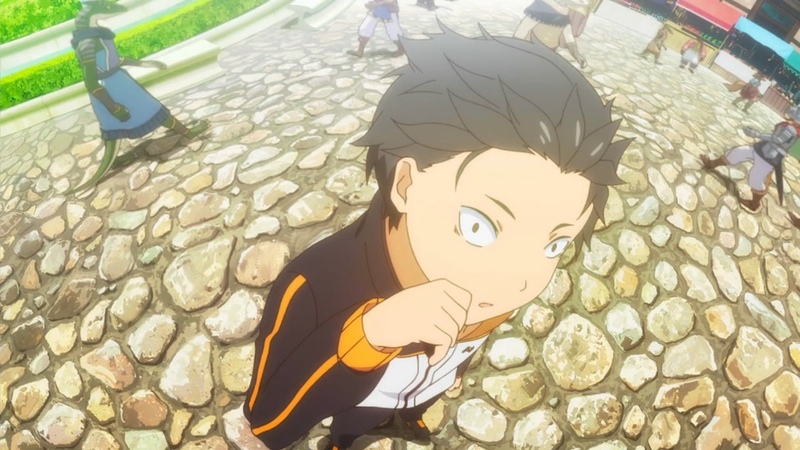 If you haven't seen Re:ZERO yet, you might have rolled your eyes in the Characters and Plot section when I said Natsuki ​found himself in a fantasy world with his cell phone (an intentional reference to a wish-fulfillment anime that aired recently). The premise sounds a lot like Sword Art Online or Log Horizon. While I enjoyed both series, Log Horizon especially, I can see how yet another entry in the genre might not sound very exciting. 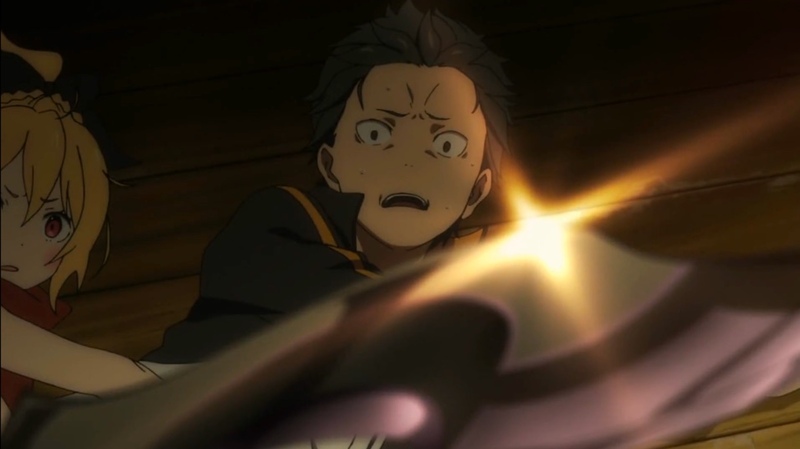 Sword Art Online in particular provoked a lot of ​criticism for seeming to place more importance on wish-fulfillment than on character development or drama. 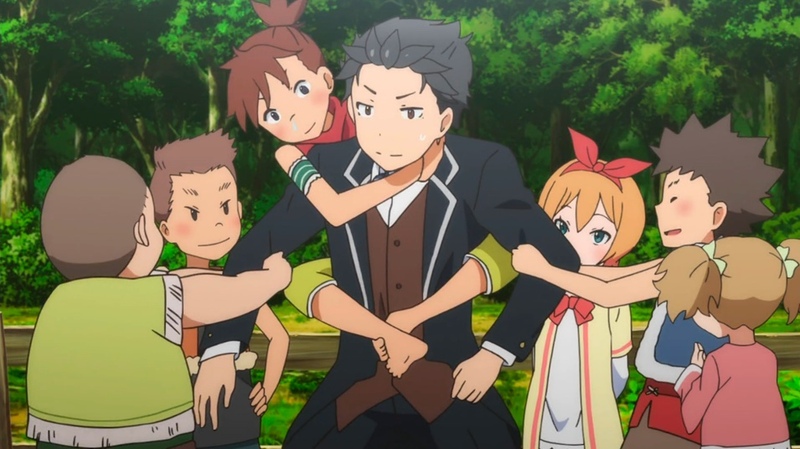 I mean, just how many women can take an interest in ​Kazuto Kirigaya, the main character in Sword Art Online? Every cour seems to add one or two to his orbit! And they all seem so accepting of each other! That's just not dramatically possible! ​Not only that, but things seem to go ​Kirigaya's way. Sure, he has his struggles, but like Ernesti Echevarria from Knights & Magic (which I dropped for this reason), his NEET-ness and knowledge of modern science helps him win the day. So, was it smooth sailing for our hero? Did he always get to look cool in front of Emilia? Did all his strategics pay off? Was he always the hero? No, no, and, uh, no. Capture from the Crunchyroll stream. Re:ZERO doesn't have that problem. It is painfully, and sometimes embarrassingly, realistic and honest. Natsuki finds himself in a world with a complex and dynamic political structure. Its society is well-established and as much a labyrinth as ours. He has no magic (at least nothing he can really control), only modest strength, no weapons skills, and no diplomatic skills. Realistically, what can he do? He learns the answer very quickly after he's disemboweled. Not metaphorically. Literally. An attacker spills his guts on the floor, and he bleeds to death. In other words, with his current skill-set, the best he can do is die quickly. And painfully. ​​​That's not how it works in the world of Re:ZERO. Does our hero discover some hidden power? Some amazing combat skills? Nope. In this scene, Felt only managed to prolong Natsuki's struggle. Capture from the Crunchyroll stream. Ironically, his first death (​yes, his ​first​ death)​​​ did expose one power that this world ​granted him:​ when he dies, he comes back at a what would be a save point in a game. He remembers everything, including all of the agony, but the people around him remember nothing. So he's able to learn from his mistakes and begin making "progress," which means he can solve a particular problem (like not getting his guts spilled on the ground). As time goes on, though, it's increasingly clear to him that he really doesn't know why's he's been called to this world. Or even if he was called to do anything at all. How ​Re:ZERO handles Natsuki's growing burden of remembered deaths is one of the things I love about the show. Far from making him jaded to the idea of dying, the memory of the pain and humiliation of his deaths makes him even more afraid of dying. It begins to affect his decisions.HE loses perspective and makes terrible decisions. I liked that realism. 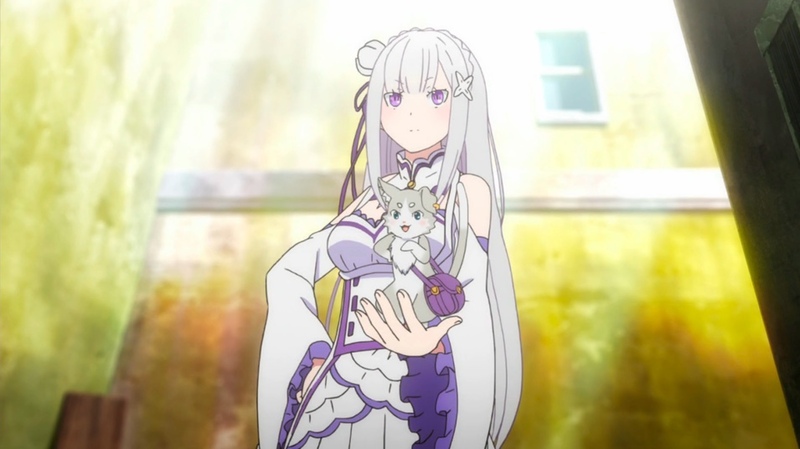 As he becomes closer to Emilia, he begins to ​invest himself completely in the idea that helping her succeed is his mission. The more ardent he becomes, death after death, the more bewildered Emilia becomes, because she has no idea why he's so dedicated. From her perspective, they've only known each other a short time. The show masterfully builds this to a dramatic point where the two of them have quite the confrontation. I can't say much about it because I don't want to spoil ​the scene. I'll just say that it's a great example of one of the painful and embarrassing ​moments I mentioned: painful because of the brutal emotional honesty, and embarrassing because it's a) so against how I would like to see myself and that scene and b) so much like how I'm afraid I'd really be in the same circumstances (if I'm being honest with myself). In other shows in the same genre, you rarely see a scene like this one where the "hero" is so emotionally destroyed -- by the heroine! And though he deserved it, it was wonderfully painful to watch! Capture from the Crunchyroll stream. ​The consequences of "Return by Death" (as Natsuki calls his ability) ripples through the plot. At first, he refrains from telling anyone about it, because he knows it would generate suspicion. But there came a point where I was almost shouting at the screen for him to just tell someone -- someone in particular. Then, wonder of wonders, he did! And Re:ZERO's relentless realism kicked in, and things got terribly and horribly worse. Not only did the plot deny Natsuki an easy escape. It denied it to me as a viewer, too -- in a wonderfully dramatic way! I've described a little about how Natsuki reacted to some of the misfortunes piled on him. There are times he takes them in good stride. There are times he breaks down and sobs like a child. And each time, I grew to respect the character more, even though I felt sympathetic embarrassment. Natsuki's reactions were those of a real person shoved into this situation. No wish fulfillment. No easy access to a harem. No fawning public because of a perceived gif. I found that liberating in this genre. I don't want to leave you with the impression that I thought Natsuki was a hopeless idiot. Far from it! He had a lot of good traits, like being able to get along with kids! He was a realistic and balanced character, and that's what I liked. Capture from the Crunchyroll stream. Beatrice is another interesting character, She acts like she hates Natsuki, and his sense of humor and playfulness ​is part of the reason why. But when he's in the most need, she ​helps him. Of course, she's liberal with her acerbic comments, but he begins to interpret those as a strange sign of affection. Ram, the older twin, is also free with​ insults, and to be honest, Natsuki earned most of them. As you get into her backstory during the first cour, you gain more and more sympathy for her (and Rem!) to the point that it's almost impossible not to root for her. Pretty smile? Sure! But by the time you find out why she's smiling, and what she, Ram, and Natsuki had to go through to get to this point, the beauty of this moment takes on a life of its own. Capture from the Crunchyroll stream. ​The last of the main characters I'll talk about it Rem, the younger twin. The phrase "last but not least" was invented specifically for this case! I don't want to spoil any of the surprises, so there's not a lot I can say, except that she and Ram shared a lot of the same back story. 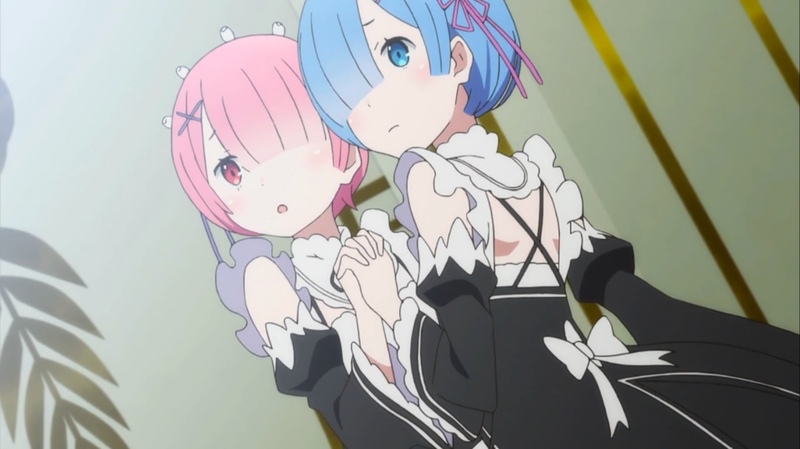 Though Ram came out seeming sympathetic, Rem came out even more so. By the the end of the eleventh episode, she had cemented herself as my favorite character in the series -- and one of the characters I cherish most in anime. She's powerful but self-effacing. She's completely devoted to her sister and to Roswaal. She's suspicious of outsiders (with good reason), but once she commits herself, she's fully committed. And I suspect her smile would melt glaciers. Not the small ones, either. Big, continental glaciers. I mentioned how much I liked the plot's realism. Combined with "Return by Death," this affords the show a tremendous amount of dramatic latitude, and no where was that more obvious than in episode 15, "The Outside of Madness." I've read a lot of literature (it was my major in college). I've read a lot of science fiction; I've watched a ​ton of series and movies and almost 300 anime series. But I can't think of ​any​ work of fiction that had the impact this episode had on me. I've watched it a dozen times; but even to this day, it transports my imagination to a very, very dark place. By the climatic scene, I can barely breath -- it's just ​that intense.​ ​​​Even just hearing the words "Sleep, along with my daughter" brings tears to my eyes, even as I'm writing this post! It's a powerful moment, powered by honest and raw emotions, involving amazing characters, trapped in a terrifying situation. Even the soundtrack was perfect. That's literature. And that's why Re:ZERO is a Caw of Fame award winner. Do you have any favorite moments from this series? Let me know in the comments! CD Japan has some great merchandise to help you celebrate Re:ZERO. Make sure to read our post about some of the finer details of ordering from them!